Back in April 2017, Google told us this was coming. On Aug 18 they finally broke the news that they would be rolling out the NON SECURE warning in Oct 2017 for any non-HTTPS sites that collected any type of data, like emails for optins or contact forms. Everybody was buzzing about the total eclipse of the sun in the U.S. on Aug 21. It was the hottest search term and hashtag online. Did you find a way to tie into that hot topic? Watch the video for more ideas on how to tie into trends and news and get more eyeballs on your content. A fun example of how I tied my biz to the buzz of the week and how you can too. SiteGround sent emails out on a name change to SG Hosting. There are only two plugins I’ve found so far that can restore share counts after HTTPS upgrade. See what they are. See why you best get on the list for your HTTPS conversion now if you want to meet that Oct deadline! Dreamhost was crippled in a massive DDoS attack that took most sites down for a good part of the day. They did a great job of mitigating it and had sites running again in under 24 hours. This kind of thing is why it’s imperative for you to have a solid backup strategy that has your entire site and the files below the WP install like your .htaccess and such. And then store those files off your site. If your site gets goofed during one of these attacks and the backup files you’re storing on your host, whether yours or the host’s get glitched too, that’s it. Your site is gone. For those of you who already have the 4 non-optional site upgrades of PHP 7, HTTPS, security, and performance taken care of, get a peek into what’s next. You know I stay way ahead of the curve on what’s coming down the pike for site success so I can keep you prepared. I also heard rumor that Bluehost now offers free SSL certificates, so I started checking into that. They do, and I added a report to Tips Tuesday for 8/29 on it. Big news for site owners that run ads! Now there is a content policy security header that can be added to HTTPS sites that will take care of all those mixed media warnings when a random ad comes through as HTTP. Webmaster tutorials in Level 3 have been updated with the new security header. 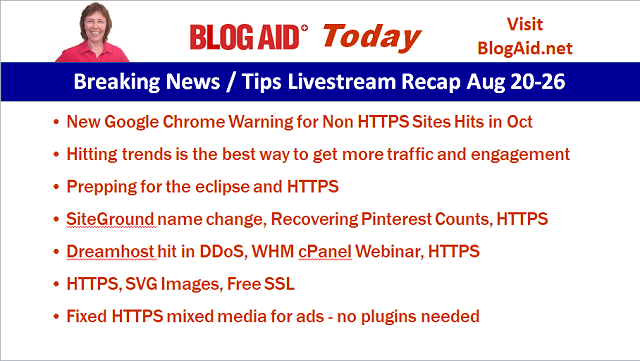 Be sure to subscribe to BlogAid News and leave that little checkbox on to get my post delivered to your inbox so you never miss anything to keep your site successful and ahead of the curve.